The Meth-X Substance Test allows you to accurately identify drugs and drug residue on any surface quickly and easily. 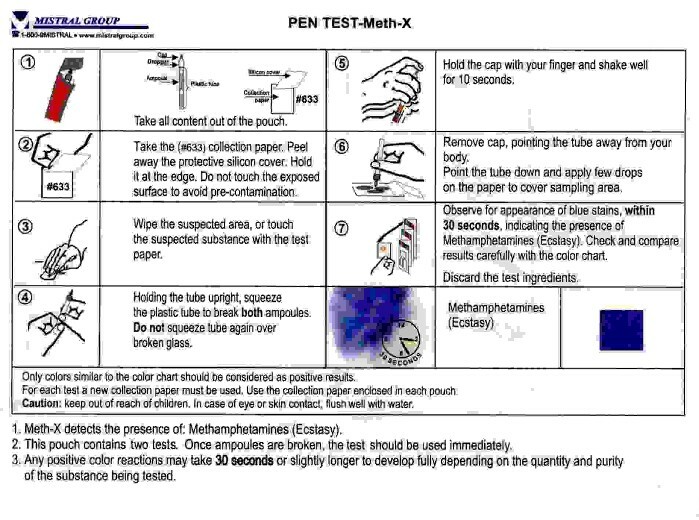 The Meth-X Pen Test detects the presence of Methamphetamines or Ecstasy in any substance or even a residue left on a surface. A Substance Test can be used in the privacy of your own home to determine if a found substance is a drug. Simple to use, safe, accurate and providing results in seconds, the drug identification test is an ideal solution for home, school and work environments. Each one-time use test kit consists of two collection papers and one pen ampoule with the testing fluid inside. You can test two substances or one substance and also a surface, however, you have to complete both tests once you squeeze the plastic tube which breaks the inside ampoule and releases the testing fluid. This test will show positive if the substance you are testing contains Methamphetamines or Ecstasy. Meth lab? Are you concerned that a house or apartment has been used as a meth lab? The Meth-x pen test can detect meth residue on any surface that may have been touched like, door knobs, handles, countertops. The residue of drug making typically builds up strongly in the area it was manufactured or cooked like the kitchen or bathroom near a vent fan. You can swipe the pen in these areas and detect trace amounts of meth. Please note: The Meth-X Substance Test - Methamphetamines Test is a substance identification test that identifies drugs and drug residue on any surface - not a urinary drug test.